Jala.tech is building the Blumbangreksa tool and a real time platform for shrimp farmers to monitor crucial pond conditions in the world's largest maritime nation. Farmtech startup headquartered in Yogyakarta also provide advice to shrimp farmers through smartphones to take action that needs to be done according to water quality and shrimp conditions in the pond. Jala created a tool called Blumbangreksa to monitor the water quality of ponds and shrimp in real time as a key to the success of a shrimp farming business. 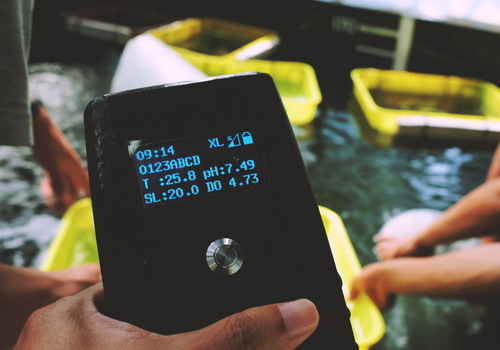 The platform uses Blumbangreksa as the primary device where users can measure pH, salinity, temperature, and oxygen levels in water. Jala created a tool called Blumbangreksa to monitor the water quality of ponds and shrimp in real time as a key to the success of shrimp farming business. The platform uses Blumbangreksa as the main tool where shrimp farmers can measure pH, salinity, temperature to oxygen levels in water. Startup was established in December 2015 by Raynalfie Rahardjo, Syauqy Nurul Aziz, Hanry Ario and Farid Inawan present various features according to location parameters and cultivation time. Shrimp farmers get direct analysis results using smartphones and action suggestions they need to take. "Today, Jala has been used in 60 ponds owned by ten shrimp farmers scattered throughout the island of Java. Platforms are also widely used by researchers to analyze the characteristics of water," said Jala MFO, Liris Maduningtyas. So far, Jala is still focused to market its services to the farmers in Indonesia which has the longest coastline in the world. Farmtech is still running bootstrapping operations with 8 engineers and marketing. Maduningtyas said the main obstacle was the mass-making of monitor devices where most of the materials had to be imported. "We are superior to similar equipment manufacturers, we do special advisory services for shrimp farming. Going forward, we will also build a system of artificial intelligence and more complex actions for the fishermen," Maduningtyas said.